My fatigue is much better today but still not resolved. It's pretty wild how such a brief workout of 4 X 100 meters can be so stressful. Intensity is KING when it comes to stimulation. Both hamstrings are tight but not bad. I've had HHT (high hamstring tendinopathy) in my left hamstring for the past month or so but it hasn't hindered my training. I sit on a lacrosse ball in my car and massage every night which has mitigated it well. Every week it seems to fade a little more. I slept in today and woke up at 3:45 in a good head space. I jogged down to the soccer field and went through my typical warm-up and stretching routine and by the end my legs were firing well. Still a bit dead but I was moving quick. I extended my stretching routine out to 20:00 which felt great. I haven't been a fan of stretching but as I've done it more and more I'm gradually changing my views on it. Like everything in this sport it isn't for everyone but if it works for you then go with it. On the training plan for tomorrow is 3 sets of 200 (rest 1:00) then 100 (rest 8:00). The rest interval after the 200 is the key to this session and deceptively difficult. Once you finish a hard effort your HR continues to rise and your lactate increases as it floods through your body and will peak at about 30" post interval. IMO this is harder than running a 300. The goal on the 200's is 29"/ 28"/27". The goal on the 100's is 14"/ 13"/ 13". Not sure if I'll be recovered enough by tomorrow to do this so I'll wait and see. I'll get through the warm-up and drills and then do 4 X 50 meters before deciding. If I'm rolling the 50's comfortably in 6"-6.5" then I'll probably give it a go. Here's a pic of the supplements I'm currently taking. B complex which I've taken forever. Helps with CNS recovery, muscle tissue repair, and red blood cell production. Master Amino Pattern (amino acids) which has had the most noticeable impact on my recovery than anything. I started taking this back in ~2011 and it's one thing I budget for every month. I joke that I'll buy my running shoes from a thrift store so I can buy MAP. But it's not a joke. Maltodextrin which falls into that same category as stretching. 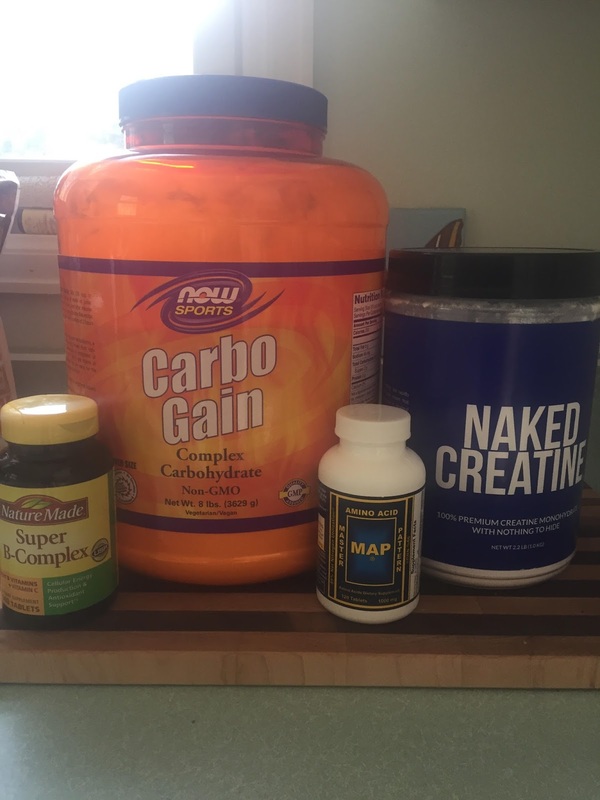 If it works for you then go with it and maltodextrin works for me. Always has. I take in 60g of carbohydrate before hard sessions and then another 60 immediately post run to start the recovery process. Creatine is a new one for me. I tried it back in ~1998 or so but couldn't really afford to keep with it. I've come back to it because of the type of training I'm doing. There's been enough research on it for me to give it a shot and see how it goes, so far I think it's made a difference. It might be a little placebo effect which is fine and good too. I find the whole idea of placebos interesting in that it points out the power of our mind. I believe that our minds are a very underrated aspect of training and racing and it edges into being more important than our body. Everything starts with our brain and thought processes. Touch a hot stove and a signal is sent to your brain, processed, then returned to your hand where you then feel pain. The will to train begins in your mind and without that will you won't train effectively. Training effectively is how you get fast and training effectively is about discipline, execution and dealing with suffering and fatigue... all that begins in your brain. The psychology of sport is also far more complex than the physiology. What happens to muscle tissue during training is pretty much the same in every person and how to manipulate training to exploit muscle tissue is basic knowledge. But each person has one hundred billion neurons in their brain and each person's development is completely different. How your psyche responds to a workout is utterly unique to that person. The key to excelling in running is figuring out your mind, not your body. When I was in my 20s and 30s, I never worried about stretching. Now that I'm in my 40s, I actually look forward to a little bit of yoga. If not a full routine, at least a few poses while the dog is doing his business in the morning. Love the blog! Just catching up on what I missed. How do you take the MAPs? I take 6 before I run and that is it. I'm open to a better way. thanks! Aaron- Same here. I've never needed to stretch but now I'm feeling its benefits! Anon- I only take MAP around hard or intense sessions. I'll take 5 before and 5 after on an empty stomach which helps absorption. If it's a particularly brutal session then I'll also take 5 more about ~3 hours post. On easy days I don't take any. That's more me being thrifty though :) If I had unlimited supplies I'd probably take 10-15 every day.